You have just discovered an easy way to migrate customer support data to Help Scout. See how our import tool can save your time and resources. Your information is safe with us and used only for the data import. Starting the import to Help Scout requires no more than twenty minutes. Our service was made to bring you an easy to use import tool that gets the work done. All tickets will be imported to Help Scout with their corresponding agents, contacts, and attachments, that way, saving the record of customers' requests. Register and start your Help Scout import. Select and connect your source customer support desk with HDM. Give access to your Help Scout account. Determine which data need to migrate and which have to stay. Import a small amount of records to see our service in action. No strings attached. 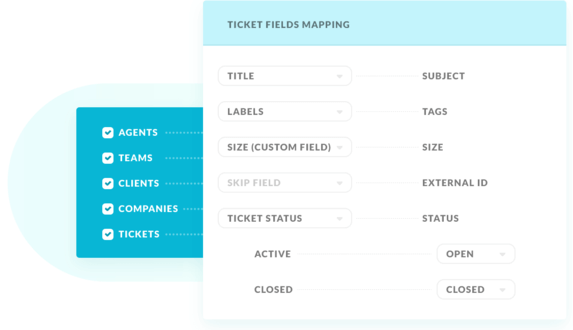 Transfer all your customer support data in a single push. We consider security very seriously and have established a comprehensive set of practices , technologies , and policies to help ensure that your data is secure.